To build the tower ruin shown here, you will need 8 castings of mold #704 (4" ruined fieldstone mold) and 6 castings of mold #708 (8" ruined fieldstone mold). 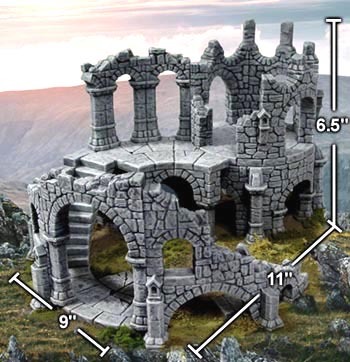 You can also find them on our building plans page labeled as "Forgotten Tower Plans". These will print out on two separate sheets that need to be taped together. Trim the edge and two corners off one half of the plan as shown. Align it with the other half of the plan and tape it together. I am going to glue this plan onto 1/2" thick insulating foam. However, feel free to mount this onto plywood, MDF or any other stiff board you would like. Draw around the outside of the plan, remove it from the foam and then spread on a layer of glue. 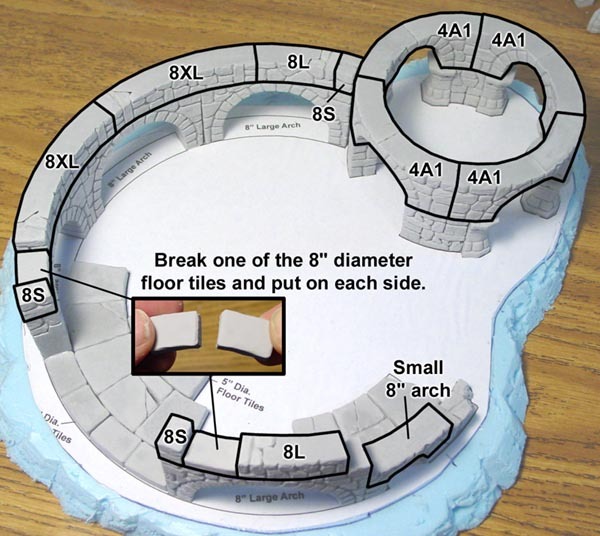 Lay the plan down onto the glue and then trim away the excess foam using a hobby knife or retractable cutter. Texture the outside edge of the foam to look like rock. Start by making several vertical grooves at various depths and angles. Space these apart about 1/2" to 1.5" apart. Next cut many horizontal grooves close together. Vary the angle a little so that some strips of foam will end up falling out at random. 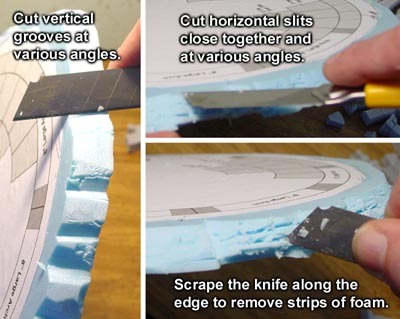 Finally, scrape the tip of the knife across the grooves to remove a bit of the extra foam and to also rough up the surface. When casting the blocks from molds #704 and 708, keep the blocks in separate piles as you remove them from the mold. Do not mix up the 8" and 4" diameter piles because these ruined blocks look very much alike. Keep these two diameters separate even after you glue the arches and regular blocks together. 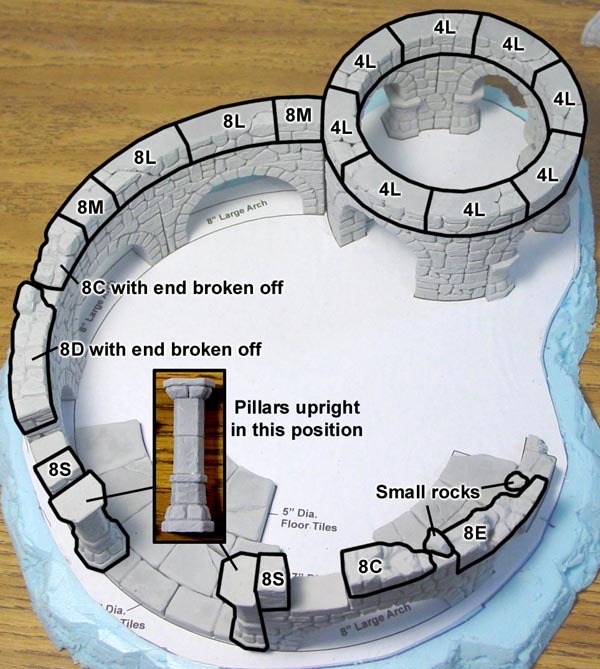 The outside ring of the tower only uses the 8" diameter blocks and the smaller tower only uses the 4" diameter blocks. With the base finished, it's now time to pre-glue several blocks together. Start with the arches. Glue together five large 8" arches as well as eight large 4" arches. Two identical blocks can be put together to make a full block. This only works for the regular ruined blocks and not the arch blocks. After you put a few together, I've labeled them so you can see what blocks I am referring to later on in the building plans. The smallest blocks (8S and 4S) are full blocks on their own and do not need to be assembled. Since we are going to need a lot of full blocks to build with, you will need to pre-glue several of the blocks together. Do not glue all of them together. 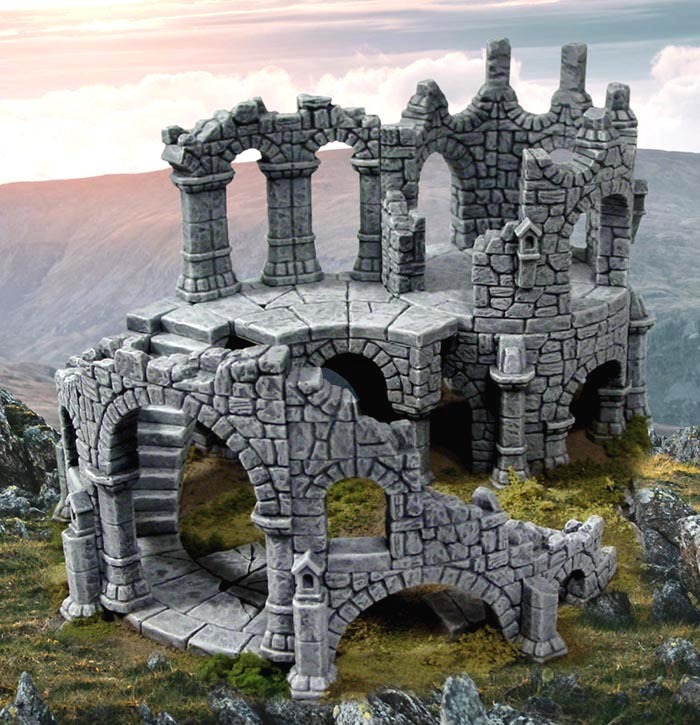 We will still need a few ruined blocks to decorate the top edges of the tower. Only glue together what is shown here. Try to make your pile of blocks look exactly like the photo, with unglued ruined blocks setting beside each other. These unglued ruined blocks will be used to decorate the top of the ruin. Glue together the pillars sections shown here. This will make assembling the tower a much faster process. All of the pillars here are shown in their upright position, exactly as they will be oriented on the finished tower (so you don't accidentally put them on the tower upside down). Glue together five of the step blocks. You will probably have to do this a few at a time and let the glue dry in between. These blocks will naturally form a 7" outside diameter that will fit inside the 8" diameter wall blocks. 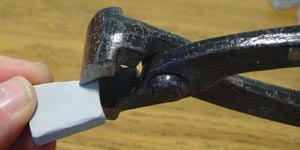 Tile nippers will be extremely helpful for this project. These will cost you about $10.00 and you can find them at your local hardware store. These are usually used to trim ceramic tile for floors and walls. We will be using them to trim off the excess dental stone from our floor tiles and make cracked tiles. 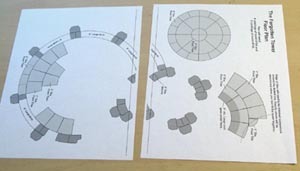 As you can see from the first photo, the tiles for the 7" diameter look very similar to the 5" diameter tiles. The best way to tell them apart is to stack them together. You should be able to tell the difference between them this way. If you want cracks in the tiles, use the tile nippers to break the tile. Then use a hobby knife to bevel the top edge of the crack. When you glue the tile back together, you will have nice cracks in it. Trim the floor section out of the printed plans. Glue your floor tiles directly onto the plan as well as gluing the tiles to each other. 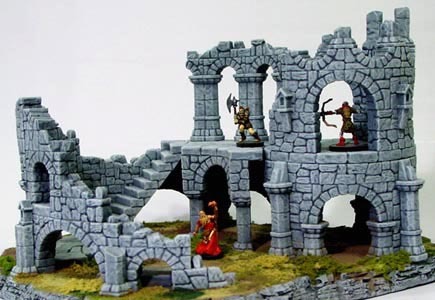 You may want to add cracks to the tiles as you do this. 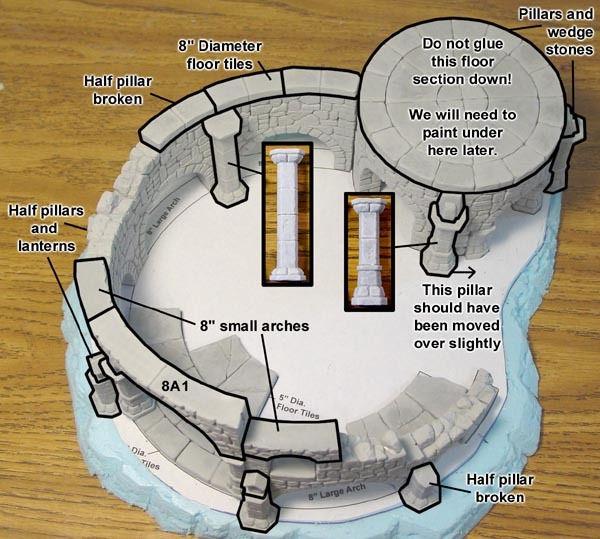 Once dry, flip the section upside down and glue on the 4" large arch and the first two pillars you have pre-glued from step 8 above. Also glue the floor tiles for the 4" circuclar floor section together using the floor plan as a guide to keep the circle round. 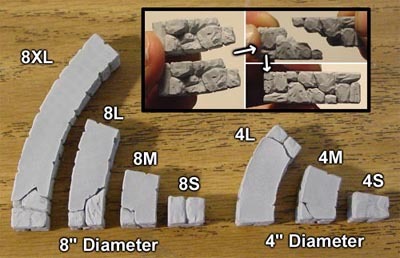 Be sure to refer to the photo on step 7 to find the correct blocks you will need. 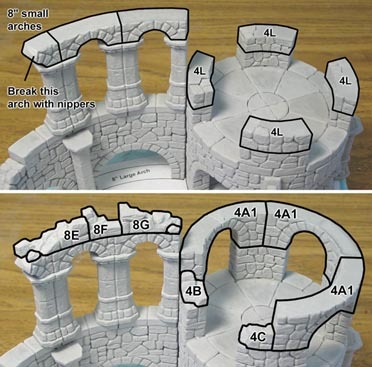 The arches are labeled on step 5 on the instructions above. In the bottom left photo, break one of the 8" diameter floor tiles in half, then place one on each side to form the window sills. On the right photo, place the two pillars with the thicker portion on the bottom. 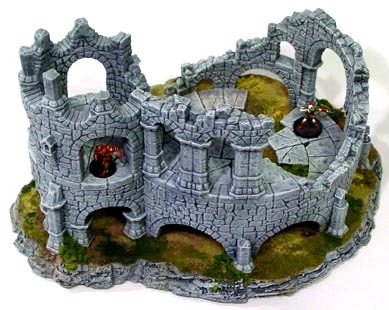 Small rocks from either mold are used to help cover any plain flat areas left. Refer to step 7 above to see which ruined blocks are used. Do not glue the 4" round floor section down! We will need to remove this tower starting at this point in order to paint the underside. This will also help in fitting the staircase and platform section. In the lower left photo, block 8G is actually placed a step down from the 8D piece, which is hard to see here. Also, one of the 8" small arches is broken with nippers in the right photo. For the final rows, glue on the 4" small arches upside down on top of the ring. Break off the half pillars at the various heights shown. 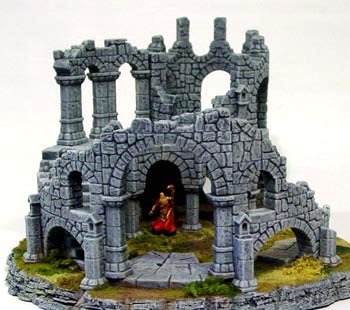 Since these will be flat and smooth on the back side, you may want to chip up the backs of these pillars using a hobby knife. Be sure the round tower lifts off. Place the stairway so the bottom fits onto the glued down floor tile and the top is flush with the 8" ring of wall tiles. Do not glue this! We will need to paint the stairs separately. 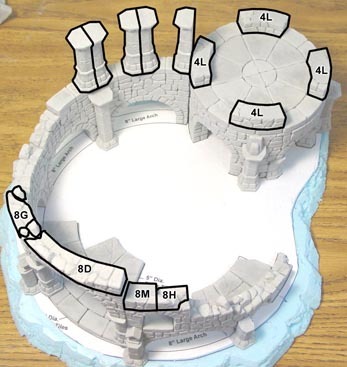 Remove the round tower top. Keep the stairway in place and set the platform against the stairs. 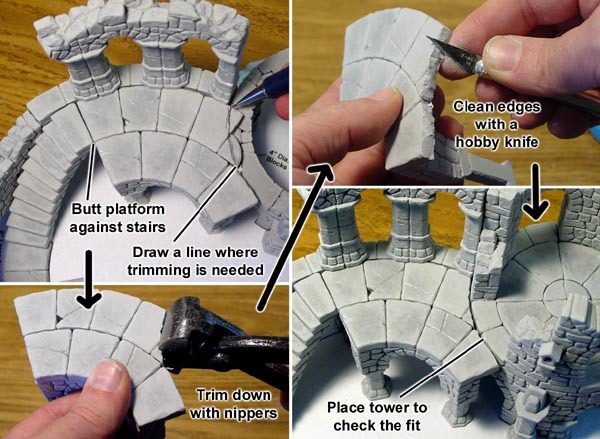 Draw a line as to where the tiles should be cut and trim them down using the nippers. It's best to nibble away small bits using the nippers. 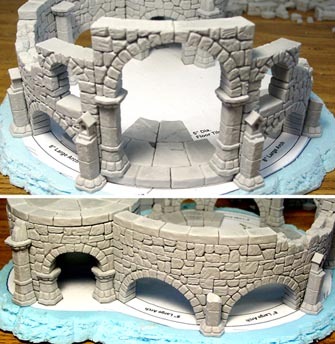 Clean up the edges using a hobby knife until the platform fits when the round tower top is set back into place. 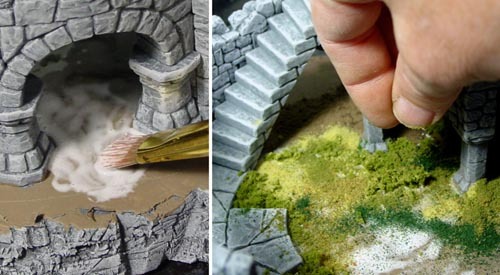 Don't forget to also paint the rock cliff edging around the base. 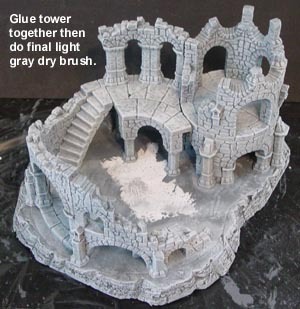 Glue the completed tower together before applying the final dry brush of light gray! This will help blend the sections together. If you cannot reach inside for the final dry brushing, it will be fine because those areas should be dark anyway. The next step will be to paint the ground a dirt color. Onto that I'm sprinkling on fine dirt and ground foam scenic materials. The miniatures shown in the photos are 28mm figures from the Descent board game by Fantasy Flight Games.